The interview season for the "Theoretical and Mathematical Physics" master programme at LMU is approaching quickly. We have to come up with new questions and problems that help us judge our applicants. It turns out to be easy to find questions in quantum mechanics and those easily lead over to mathematics questions. However, we were always short on good stat mech problems. One possibility is to have an easy start with the harmonic oscillator and then couple that to a heat bath and compute the partition function (with geometric series featuring). But this time, we thought we could vary this a bit and came to a surprising realization: Hydrogen is unstable! This was news to me but google finds a number of pages where this is discussed. Often wrongly, but the good explanation is in a 2001 paper by Miranda. The idea is the following: Everybody knows that the energy of the -th level of the hydrogen atom has energy proportional to . This level has degeneracy since runs from 1 to and then runs from to . So the partition function is . First, we thought that this might be a function named after some 19th century mathematician but mathematica told us its name is actually since the exponent quickly approaches 1 for every positive . The conclusion seems to be that there is something wrong with the hydrogen atom. 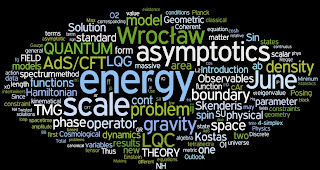 And we have not even started to consider the positive energy scattering states. Obviously, this problem has an IR divergence and it is probably better to embed it in some cavity of finite radius. But still, you would think that then for a large cavity, most of the statistical weight would be in the highly excited states and the probability to be in the ground state would go to zero as the cavity gets larger. The conclusion would be that a hydrogen atom at any temperature would almost never be in its ground state but always highly excited or even ionized. And all this only because the density of states diverges at 0. This looks like a situations worse than the Hagedorn transition that strings experience due to the exponentially growing density of states. The solution in the above mentioned paper is quite simple: Rather than these scaling arguments one should put in some numbers! Let us start with the Bohr radius, which is m and the radius grows like . This means in ameter sized cavity we can only fit states up to roughly . However, at room temperature, Boltzmann exponent and . Thus, to balance the Boltzmann suppression of the higher levels compared to the ground state one has to take into account at the order of states and not just the first . Or put differently, one should use and exponentially large cavity. Otherwise the partition function is essentially cut off at and the probablility to find the ground state is very very very close to 1. So, I did not get around to live blog from the XXVth Max Born meeting "The Planck Scale". The main reason was, that there were no hot news or controversial things presented, rather people from the different camps talked about findings that a daily reader of hep-th had in some form or the other already noticed. I don't want to create the impression that it was boring, by no means. There were many interesting talks, there were just no breathtaking revelations. I myself am not an exception: I took the opportunity of having several loop-people in the audience to talk once more on the loop string, this time focussing on spontaneous breaking of diffeomorphism invariance. By now, the PDFs are online and in a few days you will also find video footage. To get an idea what people discussed, the organizers had the idea to assemble tag clouds from the slides, some are above. Let me mention a few presentations and speakers nevertheless. Steve Carlip talked about the notion of space-time being two dimensional at very short distances in several unrelated approaches. Related was a nice presentation of Silke Weinfurter on her papers with Visser on the scalar mode not decoupling in Horava gravity. 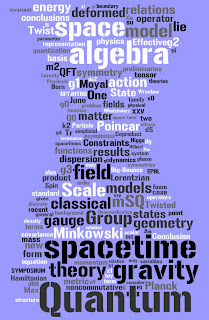 That talk was probably on the most recent and hottest results and I had the impression that many other approaches still have to digest the lesson that it is non-trivial to modify gravity and still not throw out the baby with the bath tub. Hermann Nicolai presented his work (together with Meissner) on a classically scale invariant version of the standard model in which the only dimensionful coupling (the Higgs squared term) arises from an anomaly. They claim that their model is compatible with the current data and would imply that LHC sees the Higgs and only the Higgs. Daniel Litim gave a nice overview over the asymptotic safety scenario for gravity. Bergshoeff and Skenderis talked about models related to 3d topologically massive gravity and Jose Figueroa-O-Farrill presented a summary of algebraic structures relevant for M2 theories. Mavromatos discussed possible observations of time delays in gamma ray bursts and implications for bounding modifications of dispersion relations in quantum gravity. Steve Giddings talked about locality and unitarity in connection with black hole information loss and Catherine Meuseburger explained how in 3d gravity observers can make geometrical measurements with light rays to find the gauge invariant information on in which Ricci-flat world they are living. I was surprised how many people still work on non-commutative geometry (in the various forms). The Moyal-plane, however, seems to be out of fashion (not so much because of UV-IR-mixing which I think is the main reason to be careful but many people seem to think they can work around that but are worried about unitarity on the other hand). Kappa-Minkowski is a space many people care about and Dopplicher explained why we live in quantum space-time. The general attitude seemed to be (surprisingly) that Lorentz-breaking in those theories is not an issue. However, Piacitelli, showed a calculation that should have been done quite a while ago: People say that although Lorentz invariance is broken that is not a problem since there is a twisted co-product version that preserves at least some related quantum symmetry. Piacitelly now spelled out what that means in everyday's terms: When you do a boost or rotation, twisting the co-product is equivalent to treating theta as a tensor and rotating that as well. Great, that explains why the formalism shows that rotational symmetry is preserved while the physics clearly says that a tensor background field singles out preferred directions. I had for a long time the suspicion that this is what is behind this Hopf-algebra approach but could never motivate myself enough to understand that in detail so I could confirm it. In addition, there were many talks from loop-related people (also on spin foams, BF-type theories etc) about which I would like to mention just one: Modesto applied the reasoning found in the loop approach to cosmology (I would like to say more about this in a future posting) to a spherically symmetric space-time (i.e. what is Schwarzschild in the classical theory). What he finds is indeed Schwarzschild at large distances but the discretization inherent in that approach produces a solution that has a T-duality like R <--> l_p^2/R symmetry. A great opportunity for meetings of this style with people coming from different approaches are always extended discussion sessions. 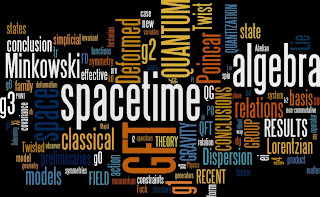 Once more, those were a great plus (although not as controversial as a few years back in Bad Honnef), there were two, one on quantum gravity and one on non-commutative geometry. There, once more, people complained that it is hard to do this kind of physics without new experimental input. Of course to a large degree, this is true. But to me it seems that also misses an important point: By no means, everything goes! At least you should be able to make sure you are really talking about gravity in the sense that in not so extreme regimes you recover well known physics (Newton's law for example). Above, I mentioned Horava gravity apparently failing that criterion and it seems many other approaches are not even there to be tested in that respect. We often say, we work on strings because it is the only game in town. On that meeting you could have a rather different impression: It seemed more like everybody was playing more or less their on game and many didn't even know the name of their game. Another example of such a trivial non-trivial test is what your theory says about playing snooker: The kinetics of billard balls tests tensor products of Poincare representations of objects with trans-planckian momenta and energies. If your approach predicts weird stuff because it does not allow for trans-planckian energies my interpretation would be that you face hard times phenomenologically, even if your model agrees with CMB polarizations.